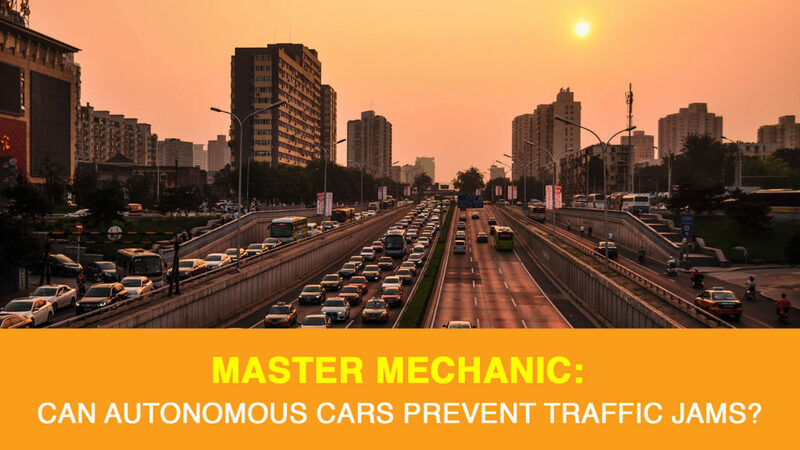 At Master Mechanic, we’re excited about autonomous cars and all the possibilities they possess. You’ve likely heard that autonomous cars are supposed to improve traffic congestion by making our commute more efficient. For the time being, cars that tout this impressive technology are expensive and have been adopted mostly by luxury consumers. Over the next decade, though, we’ll see autonomous technology trickle down into entry-level models, and eventually, the nearly 35 million vehicles that make up the traffic on Canadian roads. But in its infancy, are autonomous vehicles already capable of improving traffic conditions? New research seems to suggest that’s the case. But how? A new study from the University of Michigan has shown that even one autonomous vehicle can improve traffic conditions for everyone else on the road by preventing phantom traffic jams. Autonomous cars, on the other hand, use a 5G connection or short-range radio to communicate with other vehicles/infrastructure around it. This is how it is able to “predict” when traffic is slowing down or that a detour is required. In this experiment, eight cars were taken out in southeast Michigan. The vehicles were a mix of connected cars and one autonomous vehicle. The team drove around as a group to mimic traffic conditions, cruising at 55 mph until one driver braked sporadically. In each case, the human drivers behind that car hit the brake hard enough to lock their seatbelt. The autonomous driver, however, was able to brake so softly that it prevented a cup of coffee from spilling. In turn, this enabled the drivers behind the autonomous car to brake more gently. That’s pretty impressive. A traffic jam isn’t the only thing autonomous cars can save you from. During the experiment, braking more smoothly also saved as much as 19 percent energy in an autonomous/connected vehicle and 7 percent for the human-operated cars around it. At a larger scale, this could mean significant savings in fuel consumption or battery range. It’s also pretty common knowledge that if you put your brakes under less strain they’ll last longer. Although other cars don’t need to be fully autonomous for this network to operate effectively, they do need to be connected to a network to exchange information. While it is not currently government-mandated for car manufacturers to include this technology, many are leading the charge on their own. General Motors, for example, is already putting connected tech into the Cadillac CTS, and Mercedes has shared plans to include it in the new S-Class and E-Class series. Before long, we’ll all be driving connected or autonomous cars–or they’ll be driving us. So, while you might be waiting patiently to get a connected or autonomous car of your own, you can feel a bit better knowing someone else’s is improving your drive, too. It’s not a robot-chauffeur, but it’s a start! If you have any questions about your current car, don’t hesitate to contact your local Master Mechanic. We’re always happy to help! < Ask A Master Mechanic: How Long Should My Brakes Last?